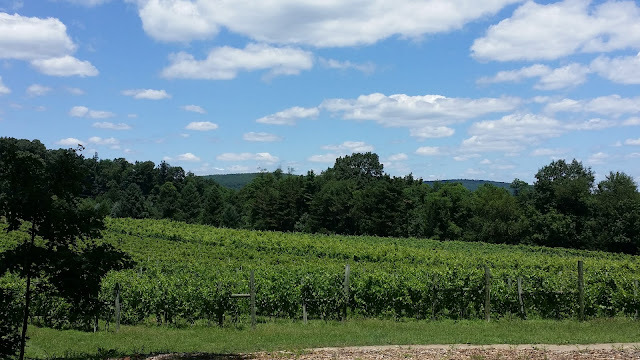 Halbrendt's Vineyard and Winery is a small family owned winery in Orrtanna, PA (west of Gettysburg) specializing in artisan wines from estate and locally grown fruit. The winery offers varietal wines and blends made from Cabernet Franc, Chambourcin, Cayuga White, Traminette, Vidal Blanc, Chardonnay and local fruit. Sometimes the winery hosts plein air painting in its vineyards. I got a chance to chat with co-owner Noemi O Halbrendt about the winery. The winery is their retirement plan! "We planted the vineyard while we had our full time job and open the winery when we retired from from our day job," Halbrendt said. "We are passionate about sustainably grown grapes and we love good wines, thus made us decide to have a small retirement winery gig." The Halbrendts' wine journey began in 1999 when a property located in the foothills north of Gettysburg was acquired. Over the next 10 years, the vineyard was established while both held full time jobs at the Penn State University Fruit Research & Extension Center. Halbrendt is a plant pathologist, and thus was able to develop a sustainable vineyard pest management program that results in high quality fruit that had been sold to local wineries and are made into fine wines. Sustainably grown means the grapes are planted with minimum tillage, and insect and diseases are managed through scouting, knowledge of the biology of pest and diseases and by knowing critical periods to spray insecticides and fungicides. "We do not do calendar spray in our vineyard," Halbrendt said. "We only spray when needed. We manage the pesticides that are used in the vineyard to avoid development of insect or disease resistance to insecticides and fungicides, respectively." When you check out Halbrendt Winery, you can expect to find white wines with fruit tones, such as Sweet Dreams, a semi-sweet white that's a blend of Traminette, Cayuga, Vidal Blanc, and offers hints of pear and smooth citrus finish; and the semi-dry Philosophy, a blend made from Vidal Blanc, Cayuga White and Traminette that offers aromas of white stone fruits, and citrus complemented by light floral notes. On the red side, the winery offers Fireside Red, a semi sweet blend of Cabernet Franc and Chambourcin that provides a jammy fruit flavor with a smooth plum and black cherry sparkly finish. Hours: open for wine tasting and sales Friday, Saturday and Sunday, 11 a.m. - 6 p.m.